Ruby diamond Art Deco engagement ring yellow gold: Description by Adin Antique Jewelry. 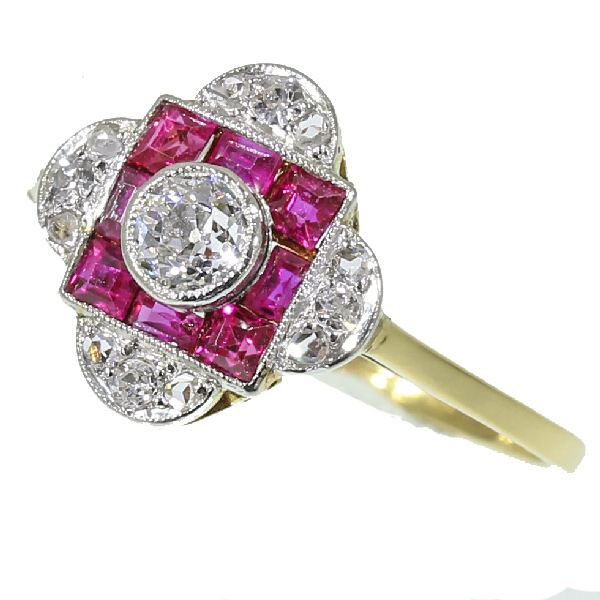 Most charming Art Deco engagement ring in 18kt yellow gold set with diamonds and rubies in cluster setting, elegant and geometric lines, crafted circa 1920s, Art Deco period... A touch of history. Extra information: engagement ring - In Western tradition, an engagement ring is a ring, of no generally accepted form, worn by a woman indicating her engagement to be married. Conventionally, the ring is presented as a betrothal gift by a man to his prospective bride while he proposes marriage or directly after she accepts his marriage proposal. It represents a formal agreement to future marriage. In recent years such rings have normally been set with a gemstone, usually a diamond, as a solitaire, of varying sizes, cuts, styles, and cost, but in the 19th century some were set with a pearl. In the same century the custom arose in England of separate engagement ring and wedding ring, and in very recent years such rings have sometimes been made en suite as a matching pair of similar style. In recent years, antique gemstone engagement rings are rapidly gaining in popularity. In some countries, such as the United States and the United Kingdom, it is worn on the left-hand ring finger, while in other countries, such as Poland and Ukraine, it is customary for the ring to be worn on the right-hand. Similar traditions purportedly date to classical times, dating back from an early usage reportedly referring to the fourth finger of the left hand as containing the vena amoris or "vein of love". In the United States and Canada today it is becoming more common, but still quite rare, that a woman will also buy her partner an engagement ring (also called a pre-engagement ring, promise ring, or 'mangagement' ring) at the time of the engagement. Diamonds: One old european cut diamond with an estimated weight of approx. 0.18 crt. Four old cut single brilliant cut diamonds (also called 8/8) with a total estimated weight of approx. 0.08 crt. Precious stones: Eight rubies (lab produced) (also called verneuil ruby).